The Portolá expedition was the first recorded Spanish (or any European) land entry and exploration of the present-day state of California, in 1769–1770, and paved the way for Spanish colonization of Las Californias Province in the Viceroyalty of New Spain (colonial Mexico). It was led by Gaspar de Portolá, governor of Las Californias, the Spanish colonial province (part of New Spain) that included California, Baja California and other western areas of present-day Mexico and the United States. Although it was already inhabited by Native Americans, the territory that is now California was claimed by the Spanish Empire in 1542 by right of discovery when Juan Rodríguez Cabrillo explored the Pacific Coast of North America. This initial exploration by Cabrillo laid claim to the coastline as far north as forty-two degrees north latitude. A competing claim was established for England by the privateer Francis Drake, who followed the route from the Philippines across the Pacific established by the Manila Galleons, reaching the California coast near Cape Mendocino and sailing south along the coast at least as far as Point Reyes in 1579. In 1596, a Portuguese captain sailing for Spain, Sebastião Rodrigues Soromenho (Spanish: Cermeño) explored some of the same coastline, leaving a description of coastal features. The Portolá expedition carried a copy of Cermeño's writings to guide them along the coast. Cermeño was followed in 1602 by Sebastián Vizcaíno, whose coastal explorations in 1602 surveyed several California locations for future colonization, including San Diego, Santa Barbara and Monterey. Vizcaíno sailed north from Mexico (as Cabrillo had done), a much more difficult undertaking because of the prevailing winds and ocean currents. After Vizcaíno, however, the Spanish Empire did little to protect or settle this region for the next 160 years, and accomplished almost no exploration by land. Affairs in Europe took precedence, keeping all of the maritime powers occupied. The little settlement achieved by Spain was the establishment of several missions on the Baja California peninsula by Jesuit missionaries. Then, in 1767 Carlos III of Spain expelled the Jesuit order from the Spanish kingdom. Don Gaspar de Portolá was appointed governor of California, sent to dispossess the Jesuits and replace them with Franciscans who would set up their own network of missions in California. Portolá came from a military background and immediately before being appointed the new governor of the Californias, he was a captain of the dragoons of the Regiment of Spain. In fact, when he first sailed to Baja California as the new governor he brought with him 25 dragoons and 25 infantrymen in order to help him with his expulsion of the Jesuits and, eventually, the further exploration of the rest of California. His military background would prove to be very helpful during the expedition. By the late 1760s the Spanish king and a handful of other European rulers began to realize the importance the Pacific coast of North America would have in maritime trade and activity. The Russians had been advancing south from their strongholds in present-day Alaska, and the British had been pushing west in Canada and were approaching the Pacific coast. In order to secure Spain’s claims in California, the king wanted to explore and settle the coastline so that he could create a buffer zone to protect Spain's territories from the dangers of invasion. Upon hearing about the king’s desire to explore Alta California, the visitador-general, Don José de Gálvez organized the exploratory expedition and placed governor Portolá in overall command. The plan called for a joint land-sea movement up the Pacific coast. The job of the ships was to keep the land contingent supplied with provisions, and to carry communications back and forth. Portola decided to travel by land. The expedition's original assignment was to travel to the "port of Monterey" described by Vizcaino and establish a settlement there. After that, the explorers were to continue north to locate Cermeño's "Bay of San Francisco" (the northern end of which is now called Drake's Bay), chase away any Russians encountered, plant the Spanish flag and determine whether the bay would make a good port. No one yet knew of today's Golden Gate or San Francisco Bay. The first leg of the expedition was divided into four parts, departing from Baja California. Two crews traveled by sea, and two groups marched north on land. The San Carlos and the San Antonio were two ships captained by Vicente Vila (whose diary survives) and Juan Pérez, respectively. The ships left ahead of the land groups, with the San Carlos departing from La Paz on January 9, 1769. Those two were followed by an additional supply ship, the San José, departing from San Blas. The San Jose never reached San Diego and was presumed lost at sea. The various elements of the land expedition left Loreto, capital of Las Californias, and moved north to Velicatá, where the two groups were assembled into final form. The first land group, led by Captain Fernando Rivera y Moncada and including friar Juan Crespi, left Velicatá on March 24, 1769. Portolá himself led the second group, which included Junípero Serra (head of the Franciscan missionaries), 25 "leather-jacket" soldiers under Sergeant Ortega, the supply train and food animals. This group left soon after the first, but traveled slower. Third in command Lieutenant Pedro Fages, who later succeeded Portola as governor, sailed on the San Antonio with his 25 Catalonian volunteers. Also on the San Antonio was cartographer Miguel Costansó, who made maps and drawings to describe the journey. The members of the expedition were a diverse group, with soldiers, teamsters and local native neophytes. In addition to Serra, and Crespi, three other Franciscan missionaries, Francisco Gómez, Juan Vizcaíno and Fernando Parrón, sailed with the San Antonio. Vizcaíno and Parrón stayed in San Diego with Serra and became the first missionary team left in charge of the new mission. Crespi and Gómez continued north with Portolá. The goal of Serra's group was the establishment of Catholic missions to convert the natives of Alta California to Christianity. Crespi was the only one who traveled with the land expedition throughout its travels, so he was made the official diarist for the missionaries (Portolá and Costansó also kept diaries). The Franciscans ultimately founded twenty-one missions at or near the Pacific Coast of what is now the state of California, in addition to one mission in Baja California. The string of California missions began at San Diego. The ships arrived in San Diego first: the San Antonio on April 11 and the San Carlos on the 29th. Both crews had been struck with illness during the voyage. Many of the crew members were very sick and the men immediately began to set up a camp and makeshift hospital to administer to the ill. Unfortunately, many men died and the ships' crews were left severely under strength. Rivera's column arrived one month later in good health and moved the camp slightly more inland to the location that would later become the Presidio of San Diego. When Portolá arrived in San Diego on July 1, he decided that although many men had perished the march would continue to Monterey as soon as possible. After two weeks of recuperation, Portolá resumed the northward march with a consolidated group of 64 soldiers, friars, and Sergeant José Francisco Ortega leading the scouts. The San José followed by sea, carrying extra supplies for the long march. Serra stayed behind in San Diego, charged with care of the sick - most suffering from scurvy. Serra established Mission San Diego de Alcalá just two days after the expedition’s departure. While Portolá moved north, more died and, by the time he returned several months later, only twenty people remained at the camp in San Diego. The party reached the Monterey Bay on October 1, but didn't recognize it as their destination because it did not seem as grand as Vizcaíno's descriptions. Continuing north along the coast, hoping to find the great port, Portolá reached the headlands in the vicinity of today's Moss Beach, from where they could see the Farallon Islands to the west and Point Reyes across open water to the northwest. They thought they recognized this as the bay named by previous naval explorers the "port of San Francisco", but had not yet seen the Golden Gate. Portolá dispatched the scouts on October 31 to examine the way forward, and they were blocked from going farther north by the entrance to San Francisco Bay. Ortega's scouts turned back south along the west shore of the bay, around the southern end and back up the east side. However, they only got as far as present-day Hayward before turning back because their allotted three days were up. When the scouts returned and described what they had seen, Portola led the entire party up into the hills, to a place where the entire San Francisco Bay was visible. Seeing that further travel to the north by land was blocked by the immense bay, the expedition turned around and returned to San Diego by January of 1770. In total they traveled approximately 1,200 miles (1,900 km) and became the first Europeans to survey the great bay of San Francisco and countless other important strategic locations. The first exploratory expedition was followed the next year by a second trip to find Vizcaíno's port of Monterey, with the intent to establish a permanent settlement. Fages, Costansó and Crespi again joined Portolá in the land party and Serra also went north this time, aboard the San Antonio. They returned to the wooden cross left on a hill the year before, and this time (perhaps on a clearer day) realized that the site did indeed overlook the place Vizcaíno had described. Portolá founded the Presidio of Monterey on that hill, and Serra founded the Mission San Carlos Borromeo (moved to Carmel the next year, a little ways to the south). For the most part, it was reported that interactions with Native American tribes in Alta California were peaceful and not too much conflict arose. Many were described as welcoming and helpful, as they offered guidance and supplies to the Spanish explorers. Friendly encounters with the native people had been a goal from the onset of the expedition. The Spanish brought many items and trinkets with which they traded for supplies and used to create peaceful relations. The fact that they used space to carry so many glass beads and other items, rather than food or more crucial supplies, in order to pacify the Native Americans shows how committed they were to creating peaceful relationships with the native people. The long-term goal was to create settlements, introduce farming, and convert the inhabitants to Christianity, so it was important that they had peaceful coexistence during the expedition. 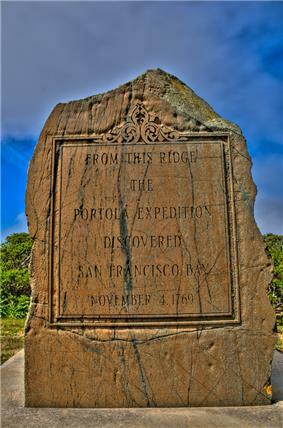 The Portolá expedition was the first land-based exploration by Europeans of what is now California. The expedition's most notable discovery was San Francisco Bay, but nearly every stop along the route was a first. It is also important in that it, along with the later de Anza expedition, established the overland route north to San Francisco which became the Camino Real. That route was integral to the settlement of Alta California by the Spanish Empire, and made it possible for the Franciscan friars to establish a string of twenty-one missions, which served as the nuclei of permanent settlements, established a cattle ranching economy and converted thousands of Native Americans to Christianity. The website of the Pacifica Historical Society features a day-by-day account of the expedition, with daily entries from all three diaries. 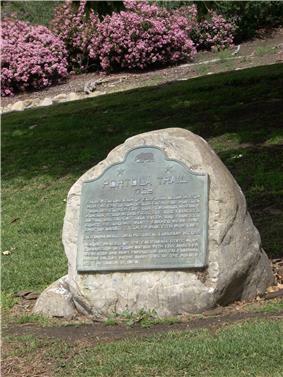 When Portola returned to Mexico in 1770, Pedro Fages (now promoted to Captain) was appointed Lieutenant Governor of Alta California, with headquarters at the Presidio of Monterey. Fages led further exploratory trips to the east side of San Francisco Bay, and left his own diaries. ^ a b c d Treutlein, Theodore E. (December 1968). "The Official Account of the Portolá Expedition of 1769-1770". California Historical Society Quarterly 47 (4): 291. Retrieved 2015-09-09. ^ Breschini, Gary S. (2010). "The Portolá Expedition of 1769". Monterey County Historical Society. Retrieved 2015-09-09. ^ Bolton, Herbert E. (1927). 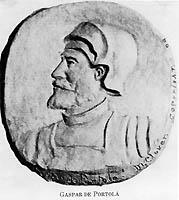 Fray Juan Crespi: Missionary Explorer on the Pacific Coast, 1769-1774. HathiTrust Digital Library. pp. 226–230. Retrieved April 2014. ^ Carrico, Richard L. (Summer 1977). "Portolá's 1769 Expedition and Coastal Native Villages of San Diego County".